Pictured below is a device we made to control the pump of an automatic and often unattended irrigation system which is solar powered. A programmable digital timer is set with the times that the pump is to be run – typically very early in the morning and in the evening. The pump for this particular irrigation system is relatively high powered, so could not be switched directly by the timer. Therefore a 10A rated relay is built into the controller. As this system is solar powered and also often left unattended, it was essential to include a low voltage disconnect which will automatically prevent the pump from running whenever the measured battery voltage is found to be <11.9V. It then waits until the battery has been charged back up to over 12.5V before allowing the pump to run again. 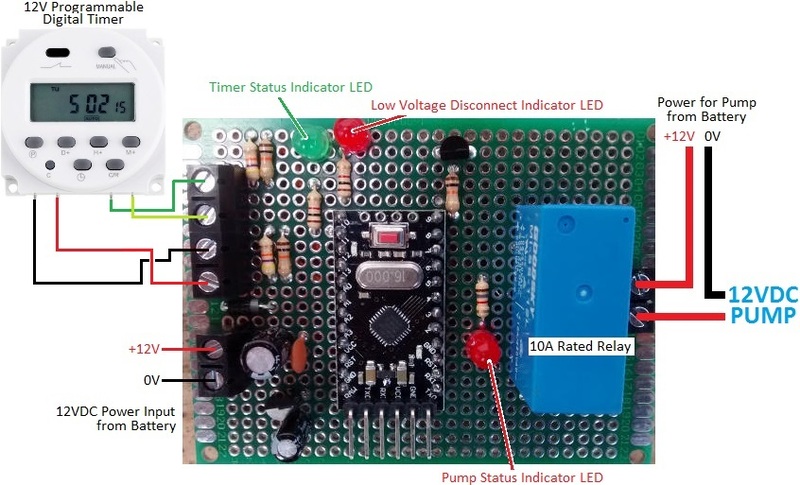 LED indicators are included to show when the programmable timer is ON, the status of the low voltage disconnect, and also the status of the pump switching relay. If you need any kind of irrigation pump timer or controller please email neil@reuk.co.uk with details of your requirements.